Welcome to 634 Ewers Rd Leslie MI. We like to refer to this place as Hunter’s Paradise. Located in SE Ingham Co. This location offers quality roads in all directions so traveling to Ann Arbor, Howell, Jackson or Lansing is quick & comfortable. This home is very energy efficient because of its passive solar design. There are 3 bedrooms and 4 full bathrooms above grade. 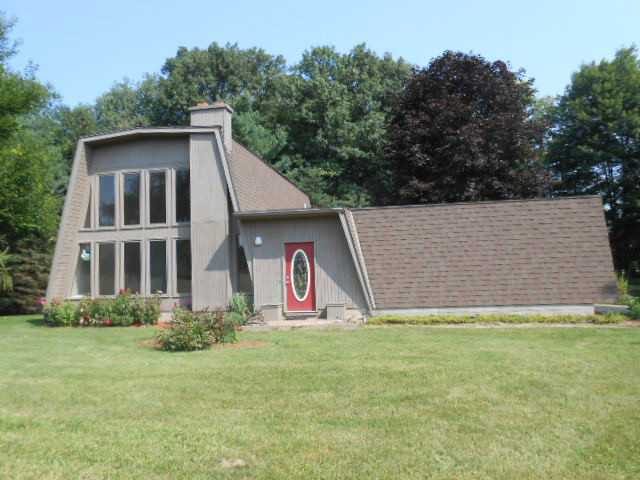 Full finished walkout basement with family room, large office and deluxe full bathroom. Recent improvements to this home include updated kitchen with new appliances and granite countertops. Both Full bathroom off of the kitchen and the in the basement have also been completely updated. The pole barn is 32′ x 48′, has concrete floors and is heated and air-conditioned. The whole package sits on 17+ or – acres, survey will be provided by the sellers. The 17 acres features a mixture of manicured park like setting, two areas of pasture land, perfect if you want to have a horse or two, and a nice pond stocked with bass and blue gill attracts wildlife galore. The property backs up to the Dansville Game Area w/ gate allowing direct entry at the NW corner. 3500 acres with 2 lakes, miles of trails, hunting areas, & loads of wild life. For additional information on this property click here! Posted on August 22, 2013, in All Other Listings. Bookmark the permalink. Leave a comment.